If you can help us please call Margaret on 01493 780126 for more information. Your help will be appreciated by all our users. If you need to get to a doctors appointment, to a dentist or to the J P hospital then contact us to see if we can help. As long as you can get unaided in and out of a car then we will help with transport. It will only cost you 45p a mile and in most cases the driver will wait to bring you back home. We still need drivers. Just give an hour or so of your time to help those without a car and also who find public transport cannot meet their needs. Please consider helping this valuable service. Councils were also invited to this event. We did learn two very interesting facts. volunteer hours, using the current minimum wage hourly rate, equates to £250,000. holder and the CCS was provided and an Evaluation Sheet completed. advertised in the Gt Yarmouth Mercury and The Village Voice. and to say a fond farewell to one of their drivers – Reg Richardson who is leaving Belton to return to Sussex to live near his family. Reg joined the Car Scheme in September 2012 and soon became a popular colleague and friend to his “clients”. for whenever they were ready to go home. He was an absolute STAR and will be greatly missed by his colleagues and everyone who knew him. He is a credit to himself and it was our great pleasure to have “worked” with him. We all wish him good luck and much happiness for the future. 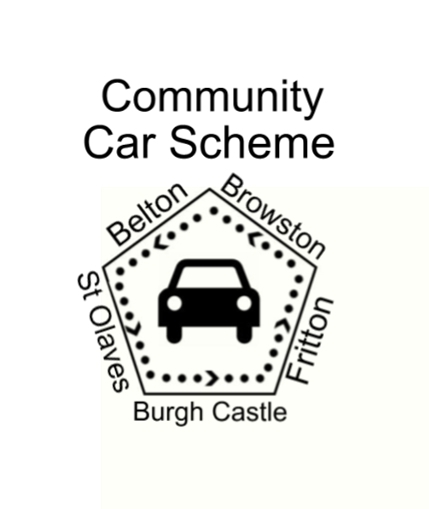 The Five Villages Community Car Scheme commenced serving the communities of Belton, Browston, Burgh Castle, Fritton and St Olaves in March 2011.
anywhere else our clients request. The general operating area is destinations within those villages plus journeys up to a maximum of 12 miles distant. hours of 8am – 6pm Mondays-Fridays, but again journeys can be undertaken outside these hours, at the discretion of drivers. Residents can make requests by ringing 07767 063 986 between the above hours. There is an ansaphone facility and all calls are responded to as soon as possible. Browston Parish Council who provide Public Liability Insurance and with the full support of both Burgh Castle and Fritton & St Olaves Parish Councils. Age Concern and also has contact with Voluntary Norfolk. We have joined the Norfolk Community Transport Association (NCTA). The NCTA is an independent charity and company limited by guarantee. The Co-Ordinator reports to her board, which at the moment consists of three community transport operators and one independent person. finances and the Co-Ordinator sees herself as accountable to members of the Association and not to Norfolk County Council. with organising free DBS (formerly CRB) checks for members. They also provide Driver Handbooks, H&S & Insurance Advice, Training & Development and HR Support. The Chairperson and Administrator/Secretary have met with the Co-Ordinator and we are positive our membership of this Association will be advantageous to us. Gt Yarmouth Borough Council recently requested that our Car Scheme be a Case Study and in particular, its contribution to the local community. able to provide her with a considerable amount of evidence to meet the requirements of the Case Study and to prove our valuable contribution to the local community. We have extended our inclusion on the Heron Website which is run by the NHS. call, we are only too willing to assist you with your transport requirements. It only costs 45p per mile. The numbers of requests for drivers in November and December 2013 were 30 and 42 respectively. These are excellent results and we are pleased that residents feel confident and happy to use our services. We did receive one enquiry from a gentleman regarding becoming a Volunteer Driver. He was sent explanatory information and also forms to complete but unfortunately he did not persue the matter further. We think it was possibly because he lived in Bradwell. We informed him that Bradwell Parish Council did not support our Scheme and consequently we did not accept requests from residents in Bradwell. If you wish to use our services or are interested in becoming a Volunteer Driver, contact details are as below. They are also available from your Parish Council and are advertised in the Gt Yarmouth Mercury and The Village Voice.